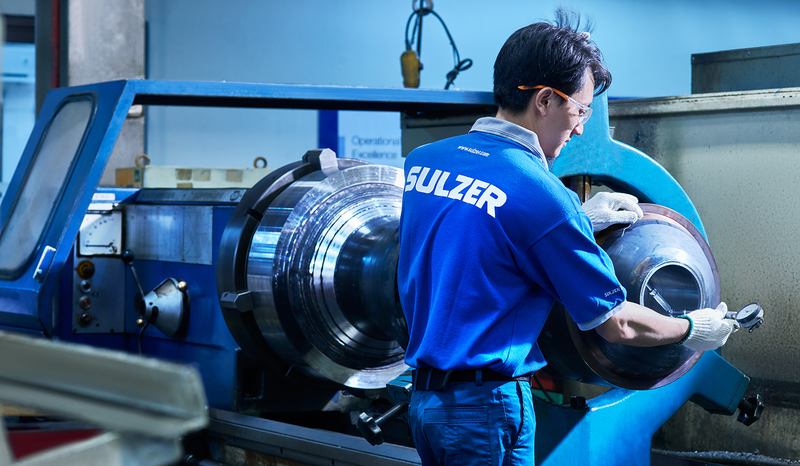 When a damaged steam turbine rotor needed to be repaired, a power generation plant in Indonesia turned to Sulzer for an expert service. Rather than wait for at least a year for a new rotor from the original equipment manufacturer (OEM), the plant opted for a repair that took only sixteen weeks. This swift and effective repair also managed to achieve an 8% improvement in efficiency. The Indonesian geothermal power plant had been experiencing some issues with one of its 60 MW steam turbines. During the previous two years, the pre-existing maintenance provider had repeatedly tried to repair the turbine, but the vibration issue had persisted. Despite several attempts to low speed balance the rotor at their premises, it still exhibited high vibration levels. During one of these off-site balancing procedures, the plant engineers discovered deep cracks that were suspected to have been caused by a previous repair by another service company. 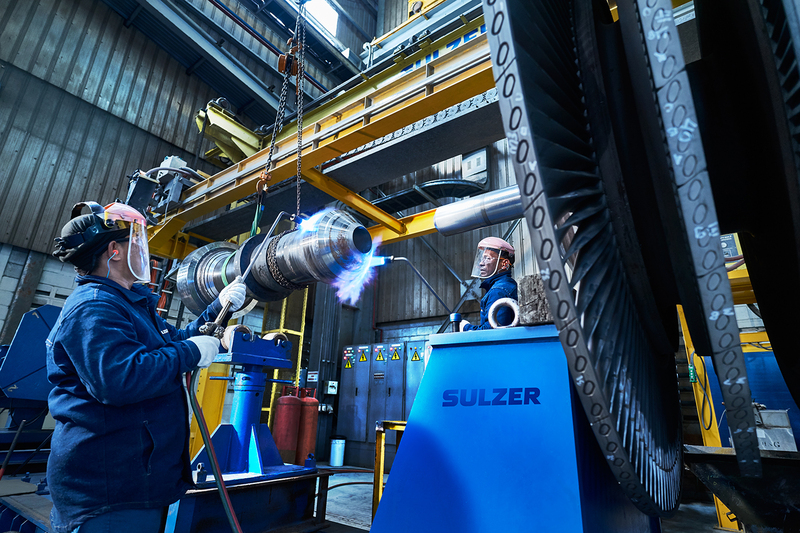 As well-known experts in the repair of steam turbines, Sulzer was called in to resolve the problem. Sulzer’s initial inspection revealed that the rotor had cracks on the radius section between the last stage disk and the gland seal area located on both the governor and the generator sides. In addition, there was considerable evidence of erosion on the blades, the disks, and the balance correction holes. Precision machining was required to ensure a perfect fit. The initial plan was to machine out the material until the cracks were removed and then rebuild the shaft using submerged arc welding before machining it to nominal dimensions. However, after comprehensive inspection at Sulzer, the crack propagation already had a spiral shape through the center of the shaft, making it impossible to machine out the crack area only. Sulzer then came up with a repair proposal that involved designing a stub shaft that would be used to join the two pieces together before the shaft was rebuilt to its nominal dimensions. With the location of the repair being so close to the 6th disk, some additional repairs would be needed to this disk, which would extend the overall time to complete the project. in order to save time, Sulzer proposed both stage 6 disks would be removed and possibly reinstated at a later date. This was then agreed by the customer. Joining two sections of a turbine rotor requires considerable expertise, including computer modeling and finite element analysis (FEA) to ensure that the proposed design would withstand the stresses of normal operation. The FEA was also carried out at an overspeed of 3’600 rpm to ensure that the centrifugal loading on the disks would not cause any damage to the rotor shaft after the repair. With all the necessary analyses completed, the machine shop started to prepare the two rotor shaft sections for the addition of the stub shaft. In-house precision machining enabled the stub shaft to be shrink-fitted into the prepared connections before the whole joint area was preheated prior to the welding process. Using precision-controlled, submerged arc welding equipment, the stub shaft was built up to a level that would allow it to be machined back to the required dimensions. Once the original dimensions had been achieved, a series of non-destructive tests (NDT) was carried out to ensure there were no flaws in the completed rotor assembly. The stub shaft was shrink-fitted to the shaft before being welded in place. These processes were repeated to remove the cracks in the thrust end of the rotor as well, bringing the completed assembly back to finished dimensions. Once all the machining was complete, the rotor was dynamically balanced before being shipped back to the customer. While the repairs were being completed on the rotor, the field service team was working at the customer’s site to repair the diaphragm and improve the sealing of the casing. This work would be influential in improving the efficiency of the steam turbine. Prior to the project being started by Sulzer, the turbine required 393 tonnes of steam per hour to produce the 53.4 MW of energy. Despite one set of disks being removed, the repair to the static and rotor components of the turbine delivered by Sulzer, enabled it to maintain an output of 55.1 MW but using only 374 tonnes per hour of steam, which is an 8% improvement in efficiency. When the repaired turbine rotor arrived back on site, the field service team carried out the installation and commissioning, which included vibration testing at full load. All the results were well within the original specifications and the generator has remained at full capacity ever since. ​What do Your Motors Really do?